I'm not really sure I can pull it off. I just don't think that length will look right on me. I really, really want to try. So I'm thinking one of these, inexpensive options might be the first! I really love the right one, it comes in lavender and cream - of which I can't decide! And then, do I have the appropriate shoe/heeled sandal?! Ahhhh being a girl is tough! 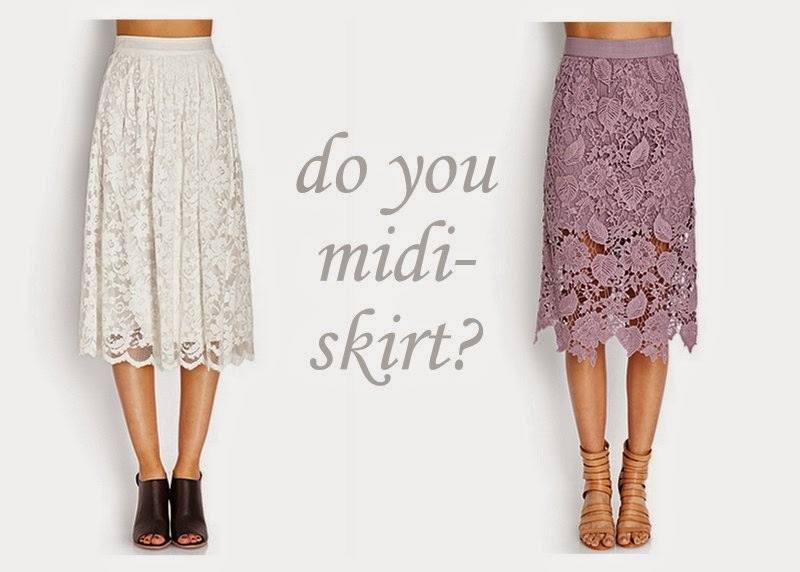 I looove that lace skirt on the right! Gorgeous! Such pretty skirts! That is actually my favorite length for a skirt. I have skinny legs so I like to cover them up a bit. I would love to, but I think I'm too short. The one time I did wear one of these I wore it with knee high boots that had about a 3 inch heel and damn did it look good! That lavender one is beautiful.